What do you think of Karl’s bikes? Do you have any questions? Let us know what’s on your mind in the comments below! Let’s take a look at Leon Hoppe’s fresh Radio Bikes setup! There’s not much else better than building up a fresh bike! The other week Leon Hoppe dialed in a brand new Radio Bikes Nemesis setup decked out top to bottom in parts from Radio Bikes, Wethepeople, Eclat and Salt Plus parts to keep him rolling. The bike was looking too good not to do a quick bike check with Leon to talk about the bike, his travel plans, filming, a new signature sprocket that’s in the works and more! Check out the full bike check below! You just built up this bike, what would you say your favorite part of it is? I think my favorite part of my current bike is the Radio Bikes Nemesis frame. It’s a very solid frame and it has a perfect geo for every type of riding, street, park, even trails. It’s a machine you can take everywhere and shred anything. What’s the oldest part on your bike? Does it have any sort of sentimental value or anything? I really don’t know. I got a complete new bike a few months ago so everything is still fresh really. I know you’re a beast on a bike. How often do you like to build up a new bike? Do you swap things out early or run it until the wheels fall off? There are some parts I change often like pedals, pegs and grips but everything else stays on the bike till its not readable anymore, which surprisingly isn’t that often. It seems like the Radio Bikes crew are always working on something new. Do you have any signature parts or anything coming in the future? Radio as a brand has grown so much in the past 2 years, Dave really kills it! I started working on my first signature product earlier this year, it is going to be a Guard Sprocket which will be super solid and perfect for the Streets, but also designed in a way so that it’s not too expensive which is great especially for younger riders. I’m super thankful for this opportunity and can’t be more stoked to be riding the prototype in a few weeks time. The sprocket will be available around October/November. I saw you’re testing out a sample of the new Wethepeople Pathfinder bars. How are you liking those so far? They are feeling great. I’ve always liked the look of 4pc bars and I really like the geo and the specs of the Pathfinder bar. Felix Prangenberg is also one of my best friends, it’s really cool to help him test some of his signature stuff. Are you pretty particular about the way you have your bike setup? Bars in a certain spot, a specific tire pressure or anything like that? Haha no, I’m not that talented at working on bikes in any way at all. I ride it even when it’s not perfect so I’m not that picky. It looks like you have been real busy stacking clips and miles. How was your recent trip to Holland with the Radio Bikes team? It was so much fun! Nothing but good times with the Radio crew. It was such a fun trip because we were able to ride so many different setups. We rode skateparks, bowls, street and even dirt all in one week, I can’t remember the last time I could do this all on one trip. It was also rad to meet new guys on the team like Brian Fox and hang out with them in The Hague. Rotterdam was so good definitely one of my favorite cities to ride . I’m super stoked on all that clips me and Robin Kachfi got there and I can’t wait for the edit to drop which should be any day now. Now that summer is in full swing, what is your travel plans looking like? Anywhere in particular you would like to get out to? I really would like to go back to Barcelona end of the year. I’ll be riding all the major street contests in Europe this Summer and for the rest of the year I’m going to try to travel as much as I can, filming some clips, meet some new people and just having a good time. I saw you have hit up a few different contests this year already. Are you a big fan of riding in contests or is it more just for fun? Do you have any plans on hitting up a few more this summer? I like the good vibe at Contests, you always travel to new places and meet so many new people. For me this is what makes contests so special, not the competitive side, but the ability to ride and meet new people in new places. I always try to hit up most of the bigger contests in Germany, Belgium and Holland this Summer and I’ll probably be going to Riga for Simple Summer Session. You have been busy filming quite a bit lately and popping up in plenty of edits. Are you working on any video projects that you can tell us about? When can we expect to see a fresh video from you? Yeah there is an edit of our Rotterdam trip with my Radio teammate Robin Kachfi coming which im pretty stoked on . I have a People’s Store edit droppijng pretty soon, and I’m going to be working on a promo for my signature sprocket later this year. I also did a couple of Trips withe the guys over at the Fella Bmx and the video should be out in a few weeks . What have you been getting into when you aren’t riding these days? Any new hobbies or things keeping you busy? No other hobbies just work to be honest haha! I’m working as a chef right now and it’s a pretty hard job but also super fun and I don’t have to work so long during the day so I have a lot of time to ride my bike than your average 9-5 job which is sick in the Summer. How can people keep up with you? Thanks to all my sponsors, my friends and my parents for supporting me riding my bike. Special thanks to my man Dave Paterson for everything he’s done for me over the past few years. Thank you Kurt for this interview and the bike check and thanks to my man Aaron Zwaal for the photos . Take a closer look at Vasya Lukyanenko’s current setup! It’s that time of the year when the weather starts heating up and the bikes start getting put through some heavy work. Vasya Lukyanenko just dialed in a brand new Volume Bikes setup decked out with parts from Odyssey, Mental BMX and more! Take a closer look at the full parts list and photos of the bike below! What do you think of Vasya’s setup? Let us know in the comments below! Check out more BIKE CHECKS! It’s been a bit of a whirlwind past year for Dan Kruk. In that time he’s been bumped up to the Wethepeople and Madera, had his first batch of signature products like the Konfetti Battleship frame colorway and Madera Party Paint Colorway, made the official move out to California, traveling a bunch and staying super busy stacking clips. Now that his signature colorway for the Battleship frame is available, we figured it was a good time to catch up with Dan and get a look at his current setup and talk a little bit about the bike, a new signature part he has in the works and more. Let’s get into it! Newest part is probably some spokes! What’s the oldest? Does it have any sentimental value? Oldest part is probably the peg cores and they just work good so I keep using them! You’re running your signature Battleship frame colorway that Wethepeople just released. What are some of your favorite parts about the frame? Well, I really like the color first of all, and I love how responsive the geometry is. It’s pretty much what I would choose if I had my own signature frame so I was very fortunate to have my colorway on it! Actually, how crazy is it for you to have your name on the bike you’re riding? I actually always forget I have signature anything, I just still do the same stuff I’ve been doing since I was 12 and really don’t think about the signature aspect of it. It is pretty cool to make my bike look how I want it, pretty crazy feeling. What do you usually change out the most on your bike? I think I go through grips the most because I always end up ripping them right away some how! Are you the kind of rider that likes working on your bike, or do you try to avoid it as much as possible? I really like to make sure my bike is pretty dialed, it works the best that way. Any weird noises or movements feel bad to me, so I just make sure everything is tight and greased up. How often do you get the chance to build up a new bike? Do you like the swap out parts on a regular schedule or do you kind of run things until they’re dead? Usually run them till they are dead, I feel bad asking for new stuff if I don’t really need it. We’ve noticed that you have fully embraced the Chicago lifestyle. What are some of the benefits to running the bars forward like that for you? There always has to be a bar question haha. It honestly makes spinning and whip tricks way easier. Just the positions your bike can get in are way crazier and really unlocks all kinds of stuff. Are you pretty particular about the way you have your bike setup or do you like to change things up to see how it feels? We actually heard a little something about a pair of signature bars that you’re working on with Wethepeople. Can you tell us a little bit about those and when people can expect to see some prototypes? Yes! I am getting my first signature product in the form of bars! Some quick specs are 9.25 tall, 11 back and 2.666 upsweep. They are named the Stallis bars because that is a nickname of the city I grew up in, West Allis, Wisconsin. I should be receiving my first protoypes in the next few weeks and I can’t wait to try them out! Will the bars be designed to run Chicago or is that optional? Haha, Chicago position and even more forward are the only angles! So you have your signature frame colorway and signature hub colorway from Madera, the new bars¦ Any other signature products you’re able to let us in on? As of right now those are the only things I have on my plate, I am very thankful for everything I have at the moment. It’s still crazy to me that I have anything! We caught up with you not too long ago, but we might as well ask! Any news you can tell us about as far as trips, video projects or anything with the sponsors you can tell us about? Heading to Fresno, CA in a few weeks for a quick WTP trip, then hopefully Ecuador in May. My new Dan’s Comp edit should be dropping any day now. Just keep your eyes peeled for more! Thanks to all my sponsors, friends and family for all the support. Shout out to Kurt for the interview! Anyone have a 6mm I think my bars slipped. There’s nothing better than dialing in a brand new bike… Well, there is. Dialing in a bike with your own name on it. Dan Coller was fortunate enough to recently build up a brand new bike with his signature colorway for the Kink Titan frame. We figured with the release of the new frame colorway and him building up a fresh bike recently, it was more than a perfect time to hit up Dan to get a look at his current setup and find out what else is new! Check it out below! Modifications: I cut my bars to about 27.75″ and my forks are cut so I don’t have to run spacers. I basically just built an entire new bike so all of it is nice and new at the moment. What about the oldest? Does it hold any sort of sentimental value? I’d say my Kink OG sprocket is the oldest part on my bike. I’ve had the same one since they did a run of them in 25t for their 20 year anniversary and it was made by the same factory in Rochester that made the original 20 years ago, so I thought that was pretty cool. I have no plans on changing out that solid beast of a sprocket anytime soon. Are you pretty particular with the way your bike is setup? Bars in a certain spot, tire pressure, certain frame length or are you pretty flexible? I definitely run my tires between 30 and 40 psi, which is very low, but it feels good whenever I find a set up where I have to take a decent sized drop. It may be harder on my bike, but it saves met wrists and ankles. Kink and Eclat both make really strong parts so I’m thankful for that. I love having a long frame with a short(ish) backend and I don’t think that will ever change. Do you ever change the setup up like tossing on brakes or are you pretty set on the way your bike is dialed in? I’ve been pretty set on how my bike is since I put on 4 plastic pegs. I haven’t changed my set up in 4 years and I don’t foresee it changing, but I’m always stoked to hop on someones bike with brakes and find a good fufuanu haha. Do you usually run your bike until it’s destroyed, or do you like to keep things dialed in? I’d say a little bit of both. I keep things pretty dialed in these days but I run my bike until it looks like its been to war. 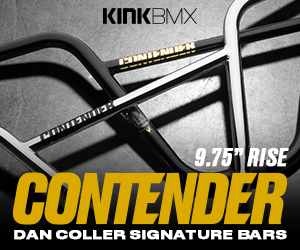 You’re rocking your new signature colorway on the Titan frame from Kink. How pumped are you to have your first signature product? It’s really awesome and I never could have imagined having a signature anything, haha. I worked with Dave Fortman (Kink Graphic designer) for the Kangaroo logo and the color and it came out more perfect than I could have imagined. Getting my own 21.25″ frame in my color way is really exciting, too. I’m stoked to have a frame out there for the tall guys! How did you decide on the translucent maroon color? Were there any other color options you considered before landing on that one? Honestly, I kind of knew exactly what I wanted the second they asked me to do a color and Dave worked hard to make sure I got exactly what I wanted. I actually based it off of the Kink Dirty Dan Sidepipe frame because that was my favorite bike I had growing up and also was the first frame Kink hooked me up with when I was about 12 years old. They have had my back since day one! Do you have any more signature stuff in the works with Kink at the moment? Not at the moment but I have some ideas for a certain product I want to get working on soon hopefully! How are things going with Eclat? Any fresh projects in the works with them? Things with Eclat are going great. The Mount Royal trip was so much fun hanging out with the entire crew, and getting to split filming duties with Krejmas was really fun. I am in the early stages of my next project which is 100% going to be an Eclat production and I’m excited to get that out. You recently spent some time in Montreal and San Diego a little while before that. What are your travel plans looking like in the near future? Any where you’re trying to get to this fall / winter? As of late I have a serious travel bug to go anywhere and everywhere. Being on the east coast at the moment there are so many spots and cities that are easy to drive to and I plan on hitting as much as I can before the weather turns. But Fall is the best around here hands down. Once it gets too cold, I definitely will go back to California and I want to hit Barcelona this winter as well. There is nothing like it out there! You had that banger section in the “Intervention” video, plenty of heat in the “Mount Royal” video from Eclat and then your Titan frame promo. Have you been filming for anything new yet? Any idea when we’ll see some more footage pop up online? Thanks! I am in the early stages of an Eclat video I’m working on but I’m definitely excited to put in work for this one. I also plan on starting something with Zach Krejmas soon so it’ll be a busy fall/winter but I wouldn’t have it any other way. Speaking of videos, we have seen a ton of people getting into that whole webisode thing. Do you see yourself getting into that or is it not for you? Nope! haha. I think it’s cool that something such as webisodes and Vlogs work for people, but I prefer to film other people, not myself. Where have you been getting most of your sessions in these days? I don’t have a go to street spot right now and I’m pretty happy about that. I usually start my day riding a little concrete park about 20 minutes outside of Rochester but other than that I end up riding something different everyday when I go cruise the city of Rochester. What have you been getting into when you aren’t riding these days? Any jobs or hobbies taking up your time? BMX truly takes up most of my time. I do freelance videography work here and there, but riding and filming riding take up most of my time. Making some healthy food or going out and finding it is the only other big time consumer I have in my life, haha. My Instagram and Twitter is @dan_coller. My Instagram is definitely the best way to keep up with what I’m up to. I rarely miss a day without posting what I’m up to! Thanks to everyone at Kink and Eclat for all the support, Aaron Smith and the Fresh Press for all the healthy meals and juice, and my friends that I ride with daily for keeping the good vibes, and to Kurt for this interview! It has been quite a while since I’ve done a Bike Check for my personal setup. I personally hate posting anything about myself, since I really do try to avoid promoting myself on here since that’s not what this website is for. However, the other day I was riding and was really stoked on the way the bike was feeling and figured it wouldn’t hurt to do a fresh bike check. I’ve been fortunate enough to keep the bike dialed in thanks to support from Flybikes and Profile Racing. Seriously can’t thank Matt, David and John enough for all the support. So, let’s take a look! Headset: Mix of a few different headset parts, haha. Pegs: Flybikes Tubo plastic up front and a Cult metal peg in the back. Modifications: Cut bars and fork down a bit. Flybikes Montana Bars that were stainless, but I painted them black to match the rest of the bike. I found anything over 9″ rise is too much, so I stick to the 8.75″ rise. Brakes!? Occasionally I go brakeless, but I just end up crashing more, destroying kids at the skatepark or getting bored since it cuts down on the trick list for me. I stick to brakes for the safety and fun for the most part. Profile Racing cranks and Spline drive combo with the Flybikes Tractor chain makes for a real good combination. I’ve been running those same cranks for a few years now. Can’t go wrong with a classic. The Matt Roe signature Roey grips from Flybikes are based off the old school Tri Ame grips that have been around for a long time. They use a slightly different design and a softer rubber compound. Really digging them. I’ve come to accept that I’m that “old dude” at 27… Metal pedals and brakes? Yep. After a while you just know what you like, and metal pedals just grip better than plastic and last a lot longer. These are definitely my favorite pedals just above the Animal Hamilton’s and Welgo MG4’s. Profile Racing Mini hub up front with an Aegis hub guard. Clean and simple. Add in the Sun Ringle Big Baller rim and a Flybikes Ruben tire and you have a sturdy wheel. I run the Flybikes Tubo plastic peg up front since I don’t burn through pegs as fast up front. I run a metal Cult peg in the back just because I tend to burn through pegs faster in the back. It doesn’t slide quite as smooth as plastic, but I couldn’t even tell you how many grinds that peg has seen… Same with the Aegis hub guard from Profile Racing. I’m also running a cassette hub. I’ve dabbled with the whole freecoaster thing and decided it just wasn’t for me. Maybe I need to try some other options, but I just was over it after bashing my knee on the stem so many times, haha. Some of you old guys might remember the old Flybikes 3 Amigos frame that had a seat stay bridge like this. They brought it back for the Geo frame and it was definitely a selling point when choosing which frame to ride, haha. The Devon Smillie signature Tripod seat. Although Tripod seats don’t have as many options as far as angles go like Pivotal seats, I’m a big fan of the simplicity, clean look and lighter weight that Tripod has. So that’s a look at what I’m currently running these days. Once again, but shout out to Flybikes and Profile Racing for keeping the bike running smooth. It might not be a setup that has all the latest trends, but it definitely keeps me happy! It’s been a little while since we’ve caught up with Daniel Penafiel, so we figured it would be a good time to hit him up and see what was new. It turns out that he just built up a brand new bike decked out with a ton of prototype parts from Mutant Bikes including the latest version of his signature Tizona frame and bars. We figured that was a perfect excuse to do a brand new Bike Check to take a closer look at his current bike and find out what else is new with him! Ready? Let’s do this!